“Here Comes Little Jenna Jafferty is as much a warning as it is the title of a children’s book. 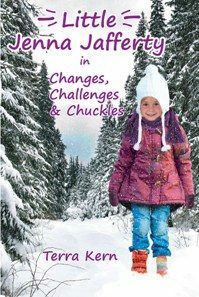 Terra Kern presents young readers with an adventurous, spirited child in her short chapter book. In each chapter, Jenna engages in some type of mischief or mayhem… Jenna is able to single-handedly keep her parents on their toes, but sometimes her older sister, Janine, is happy to participate in the fun, making it only that much more disastrous for Mr. and Mrs. Jafferty. Kern quickly captures her readers’ interest with Jenna and Janine’s antics. Before the first chapter ended, I was laughing and shaking my head in disbelief…What makes the stories even better is that Jenna and Janine are both kind-hearted young girls. They never have the intention of causing harm to anyone, and they are always apologetic when they realize they have done wrong in their parents’ eyes. Mr. and Mrs. Jafferty are the epitome of loving parents. They are never too harsh with their children and shower them with love. Both the children and the parents serve as excellent role models as a result.